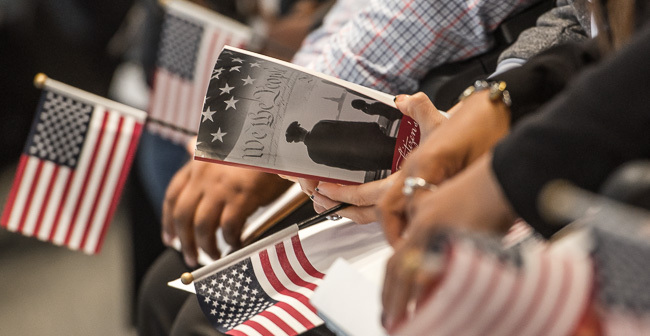 Summer on the UNCW campus began with a very special event: a naturalization ceremony hosted by the university and the Wilmington Rotary Club in collaboration with U.S. Citizenship and Immigration Services. Welcoming 37 new citizens to our nation brought back proud memories of the day in 2003 when I became a U.S. citizen. The celebrations continued in June as the Class of 2021 arrived on campus for Freshman Orientation and Marine Corp Base Camp Lejeune held a graduation ceremony to honor military-affiliated students. In other exciting news, a research team led by biology associate professor Brian Arbogast discovered a new species of flying squirrel. Alumna Katelyn Schumacher ’12M conducted vital genetic analyses during the project. Best wishes for a happy retirement to Cathy Barlow, who has served UNCW well in many capacities, most recently as interim vice provost, and congratulations to Johnson Akinleye, N.C. Central University’s new chancellor, formerly UNCW associate vice chancellor for academic programs. UNCW student-athletes have continued to earn honors this summer. Thomas Eldridge was named Colonial Athletic Association Scholar-Athlete of the Year in men’s golf, and Lauren Moore earned the same recognition in softball. Earlier this week, Moe Holmes became UNCW’s first recipient of the CAA Men’s Track & Field Athlete-of-the-Year award. Five members of the UNCW baseball team were named to the North Carolina Collegiate Sports Information Association All-State first team. Classes are under way for the second summer session, while our educational summer camps, Seahawk FAM series and July’s Lumina Festival of the Arts provide many opportunities to welcome future Seahawks and the community to campus. Whether your summer involves academics, work, rest and relaxation, or a little of each, enjoy the long days and warm evenings wherever you are. Former North Carolina Gov. 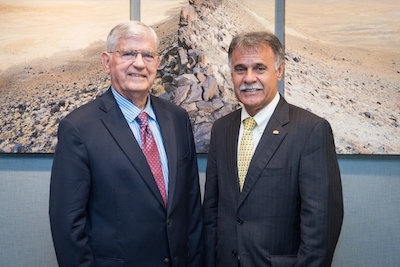 Jim Martin (left) met with Chancellor Sartarelli during a visit to UNCW. Martin, who also served six terms in Congress, earned a Ph.D. in chemistry from Princeton University and taught the subject at Davidson College. As governor from 1985-93, Martin was instrumental in securing funding to complete Interstate 40 to Wilmington. 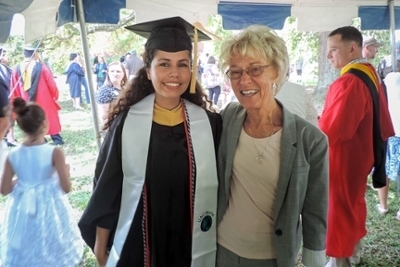 Rosa Guerrero (left), with Provost Marilyn Sheerer, was among a group of military-affiliated students participating in the 22nd annual Commanding General’s Graduation Ceremony at Marine Corps Base Camp Lejeune. 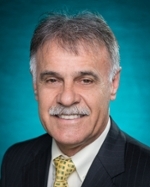 Guerrero received a Master of Social Work degree through UNCW's Onslow Extension site. 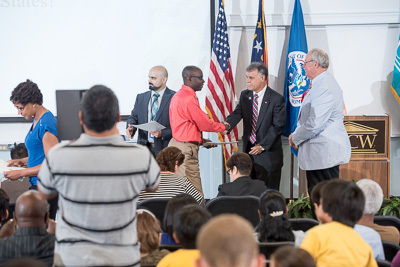 Chancellor Sartarelli congratulated immigrants who became U.S. citizens during a naturalization ceremony hosted by UNCW and the Wilmington Rotary Club. Thirty-seven people from 20 countries took the oath of citizenship at the ceremony, which was held in collaboration with the U.S. Citizenship and Immigration Services. 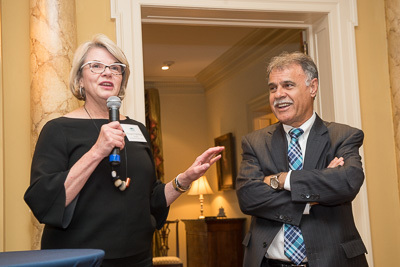 UNC system President Margaret Spellings (left) and Chancellor Sartarelli thanked representatives from the UNC Faculty and Staff assemblies for their service and dedication to students, their campuses and the state during a reception at Kenan House. 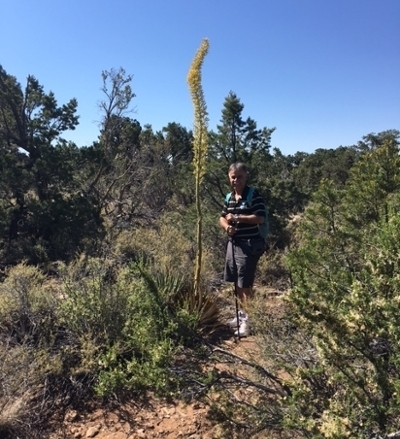 Chancellor Sartarelli found a flowering agave plant during a recent five-mile hike along the South Rim of the Grand Canyon. UNCW orientation leaders welcomed first-year students to campus with an original dance, which they also performed in a regional competition against other universities' orientation leaders. They won first place in the song category! 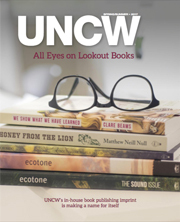 Peruse the pages of the Spring/Summer 2017 issue of UNCW Magazine, which takes a peek at UNCW's own publishing imprint, Lookout Books, as well as bees, family trees and more. UNCW Presents' Seahawk FAM series opened in June and will continue with family-friendly arts programs throughout the summer and into the new academic year. Patty Fox (second from left), a grants officer in the Office of Sponsored Programs and Research Compliance, was awarded the UNCWorld Global Travel Grant. She and other Staff Senate Award recipients were recognized at the June Staff Senate meeting. Also pictured, from left to right, are Michael Wilhelm, associate vice chancellor for international programs; Staff Senate Scholarship Committee Chair Gina Bowen; and Chancellor Sartarelli. Science and fun mixed at Summer Chemistry and Forensics Camps, hosted by the UNCW Department of Chemistry and Biochemistry in Dobo Hall. Chemistry graduate assistant Brittany Saleeby (center) is the lead instructor for the camps, assisted by undergraduate chemistry major Hannah Phillips. Timothy Sellnow and Deanna Sellnow, professors of strategic communication at the University of Central Florida, joined UNCW Communication Studies Chair Rick Olsen on stage at the 2017 Integrated Marketing Communication Conference. The annual conference, which began in 2011, encourages interdisciplinary engagement and reflection on mass communication techniques. Speaking at a meeting of the Swain Center Advisory Board, Chancellor Sartarelli discussed the value of public-private partnerships, noting that collaborations between UNCW and the business community "contribute to our region’s economic vitality." COMING SOON: UNCW Presents and Opera Wilmington have assembled an extraordinary lineup of artists for the Lumina Festival of the Arts, which will run July 14-30. The community is invited to enjoy opera, theatre, dance, film, music, visual art and performance poetry. Tickets are available through the Kenan Auditorium Box Office or online.